Our names are Pattie & Paulie. I’m Pattie, the Beautiful Lutino in Yellow and Polly is by daughter in Green. I’ve been part of Mickaboo for many years. When they first got me from a local shelter I was near death from serious wounds. Fortunately I healed up and later was adopted into a nice Mickaboo approved home back in 2006. Our parent decided it would be nice to have a mate for me so she got one and we had our lovely Paulie about 2 years ago. Sadly my mate didn’t live and ever since he died I’ve been stressed and pulling out some of my feathers. Thankfully Polly is around to help me and keep me company. Unfortunately our adoption parent had to give us back to Mickaboo since she was moving and couldn’t take us with her. Thank goodness we had a place to go back to rather than the shelter. Since being with our new Mickaboo Foster Mom both Polly and myself have been enjoying getting out of the cage a lot and interacting with her. She thinks in time we will become completely tame. Life is good right now but we hope to find a “forever home” to go to eventually. 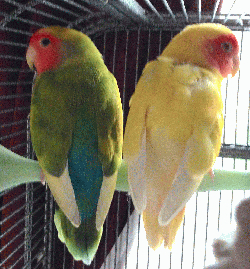 If you think that you can provide a nice forever home for us then please contact the Lovebird Coordinator and he will give you more details on how to adopt us. Please keep in mind that we only come as a pair and cannot be separated.